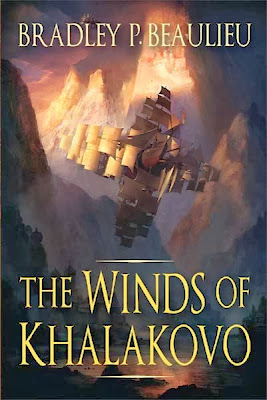 So the three books of the Lays of Anuskaya are out and two reviewers I pay attention to (Justin Landon of Staffer’s Book Reviews and Pat of the eponymous Fantasy Hotlist) love the hell out of your work ... but it hasn’t been an easy road I’m guessing? Two books into the trilogy and your publisher, Nightshade Books rolled over and died, and the chances are they weren’t much help prior to the death scene as they were probably busy falling apart? Yes, that was quite the interesting ride. The reception to the books, critically, was great. But having your publisher fall apart at the seams just as the final book was coming out was not an ideal situation. As things started heading south, I ended up getting rights back to the trilogy. I decided to run a Kickstarter to get the books out (the third, plus rebranding the first two). It was a ton of work to do so, but it was gratifying in its own way. I learned a lot about the publishing business, because, essentially, I had become my own publisher. And thank goodness for things like Kickstarter. They give the writer a viable option for bringing things out on his own, where even ten years ago one would really have no choice but to put up with whatever the industry threw at you. In the end, I'll be honest. I'd much rather be writing books than stealing time from writing to produce and publish books. Self-publishing is still something I'll consider for things like story collections or even a book I really believe in but publishers can't find a way to market, but I'm also very pleased to now be part of the DAW Books and Gollancz families. I'm excited to see where the future takes us. Onward and upward, yes? You can still download Beaulieu's The Winds of Khalakovo for only 2.99$ here.